First of all, it all has to be in the form of a clearly defined learning program. Everyone should know the path from “zero to hero”, what’s required of them in each step of the way and, lastly, how it’s all connected. Second, all content must be delivered in its own optimal way. There’s not a “one-size fits all”-solution, but more “This content should be a video, this should be in a PDF, this should be in both a webinar and an e-learning module and THIS…” etc. Third, this has to be allowed to take time. Learning isn’t a one-time-event and never will be. There’s not a magic pill that will ingest knowledge to the swallower. 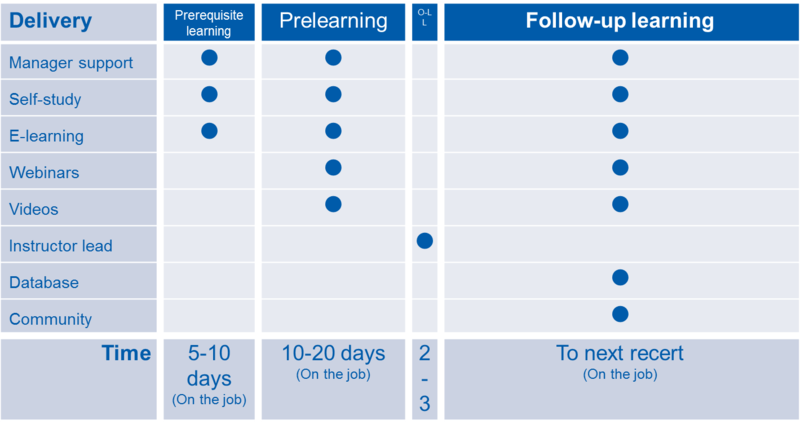 However, to sell this fact to the managers we need to make it clear for everyone involved that… Fourth, all exercises in the phases before and after should be closely connected to what the participant does, and SHOULD do at work. They should gain valuable knowledge and experience right there and then without ever leaving their “base camp”. The context and real world application is incredibly important for all courses and much so with this spreading of the learning events over time. Fifth, in the case of compliance or certification there must be a possibility to “Test out”. If someone actually already has experience they should be allowed to prove that from the start. If they pass all tests they’ll go straight into the follow-up program. This is of course mostly for the more experienced employees with years of track record in the company that predates any courses on the subject. We’ll be going to THEM for information for the course content… Sixth, we must involve and educate the participant’s manager. They must know what the program is about and its stages. They must believe in it and should be invited to participate themselves. With all this in mind we knew that we had to go from “single-layer learning”, with all of the course content being delivered by an instructor, to “multi-layer learning” as seen below. If we start with the Delivery part of the concept, the picture above clearly doesn’t show all possible delivery methods but the most classic ones. That doesn’t mean we couldn’t use something more edgy than these if the need arises. And, the Instructor lead layer will in itself contain Experiments, Labs, Self-study, Lecture, Tests etc. The main thing is that we’ve spread out the content from Instructor lead to a great number of layers depending on content. We’ve included the, oh so important, Manager Support layer to be the main driver “back home”. The manager will leverage methods such as lectures, team information, budget goals, coaching etc. to make sure the participant knows WHY they’re taking the course and WHAT’s expected from them when they come back. Moving over to the Time layers we see that we’re enabling more and more layers for each step. (I hope you remember that the instructor lead on-location learning contained a bunch of them.) What’s not seen above is how the content is spread out proportionally over time. If we’d do that it’d look a bit more like the one below. 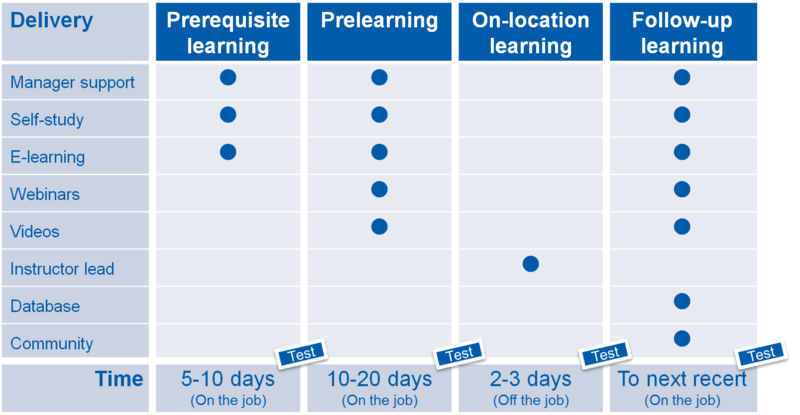 This is however somewhat beside the point, with the main point being that – we must spread out learning over time and on the job instead of having it being delivered at a training session.